Courts • Members for the newly formed panel have now been appointed. 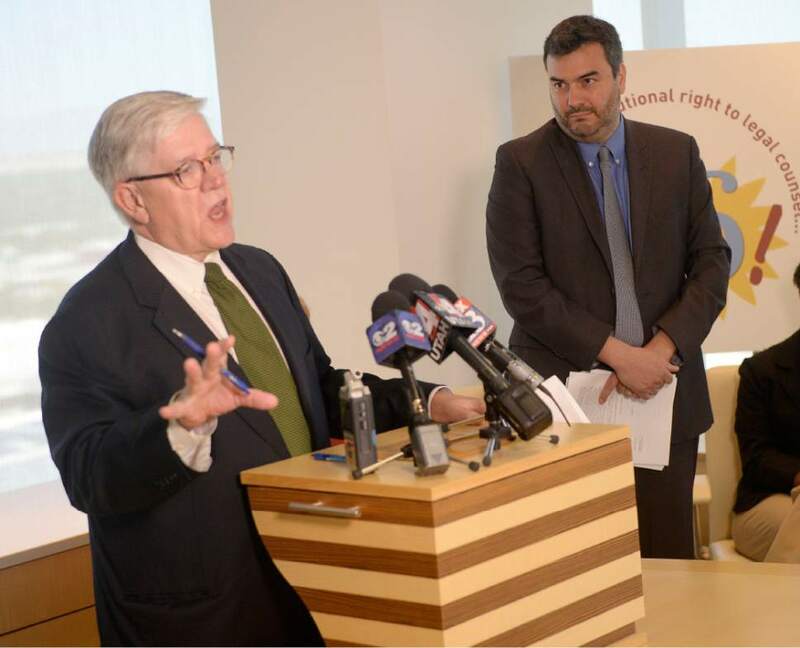 Al Hartmann | The Salt Lake Tribune Attorney John P. Harrington with Holland & Hart LLP, left, and John Mejia, legal director of the ACLU of Utah, host a news conference in Salt Lake City on Tuesday, June 21, 2016. The ACLU of Utah and co-counsel Holland & Hart have filed a lawsuit in 3rd District Court over what they call Utah's failing indigent defense system. A state-funded commission aimed at tackling myriad problems with Utah&apos;s public-defender system is now up and running. Members of the Indigent Defense Commission  newly formed after this year&apos;s legislative session  gave an update on their progress during a Wednesday judiciary interim committee hearing at the Utah State Capital. Chairman Michael Zimmerman told lawmakers that over the summer the governor appointed county and city officials, defense attorneys and other legal representatives to the committee. One of their first actions was to appoint an executive director  but Zimmerman said that process was delayed after a front-runner for the position, federal public defender Kent Hart, died in an accident in Norway in July. Hart, who was the executive director of the Utah Association of Criminal Defense Lawyers, was outspoken about the state not meeting its constitutional requirement to provide legal help to those who can&apos;t afford it. Zimmerman said the commission expanded its search after Hart&apos;s passing, and appointed defense attorney Joanna Landau to the position. She began working in early October, she told the commission, and is currently hiring required staff. Their first meeting is scheduled for November. The U.S. Supreme Court ruled in 1963 that defendants facing possible jail time are entitled to counsel, even if they can&apos;t afford it. Utah is one of two states in the nation that delegate this responsibility to individual counties, which have had no state oversight to guide their efforts in meeting the Sixth Amendment obligation. Each county differs in how it handles that responsibility. In Salt Lake and Utah counties, a nonprofit public defender association provides services, while other counties rely on contracts with public defenders or private attorneys. Zimmerman said the commission hopes to quickly dole out $1.5 million in funding to counties in the most need, while also beginning to collect data about how the counties and cities provide public defenders. "[The state] has never gathered data and has never given [the counties] any money," Zimmerman said. "We need to put in place statewide information to give them feedback. But in the process, we can certainly identify some that are in worse need than others and put some of this money out pretty quickly." Last year, the center released a report that found many flaws in the system. One of those flaws is in justice courts, where people often connect with the court system for the first time and over half of defendants are never provided legal representation. The report also found that in district courts, where more people are receiving public defenders, "systemic deficiencies" prevent those attorneys from effectively advocating for their clients. Those issues include flat-fee public defense contracts, which results in overworked attorneys who have no incentive to take cases to trial or put work into the cases, as well as county attorneys who are advising commissioners on whom to give the public defender contracts to  essentially picking their opponent in court. The American Civil Liberties Union of Utah filed a lawsuit against the state in June, saying legislators&apos; actions in creating the commission was not enough to meet the constitutional requirement. The lawsuit is now pending in federal court as the ACLU seeks class action status.